A quick turn off I-70 in Kansas. Mom saw a sign that caught her interest. We are in Wilson, Kansas. 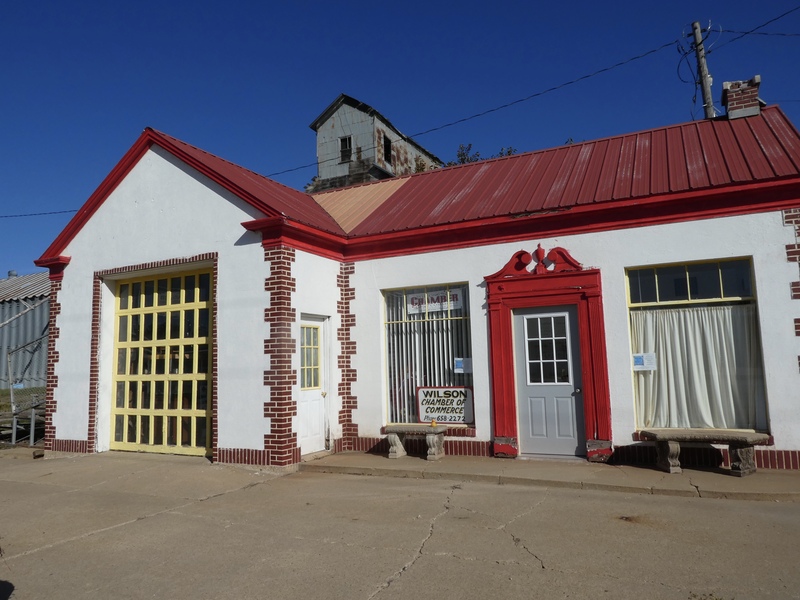 The Czech capital of Kansas? 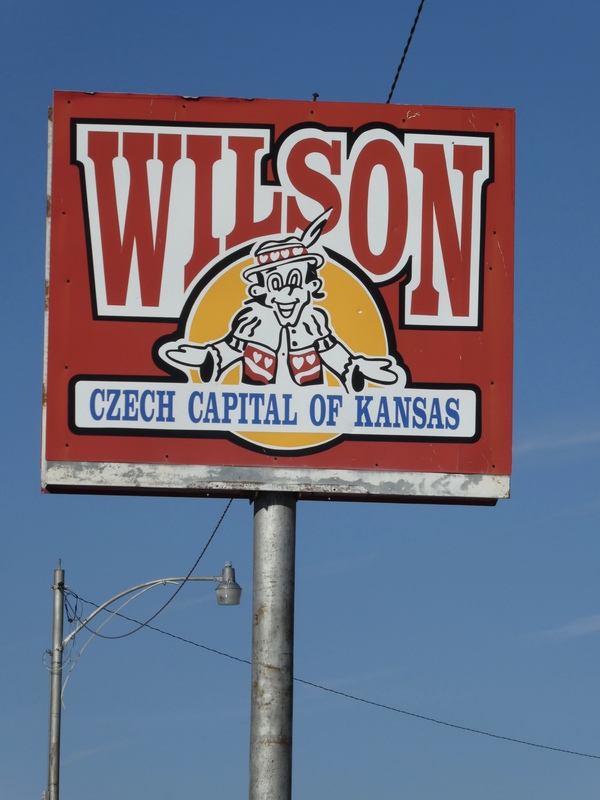 Wilson, Kansas was settled by people from the former Czechoslovakia. The part that is now the Czech Republic. 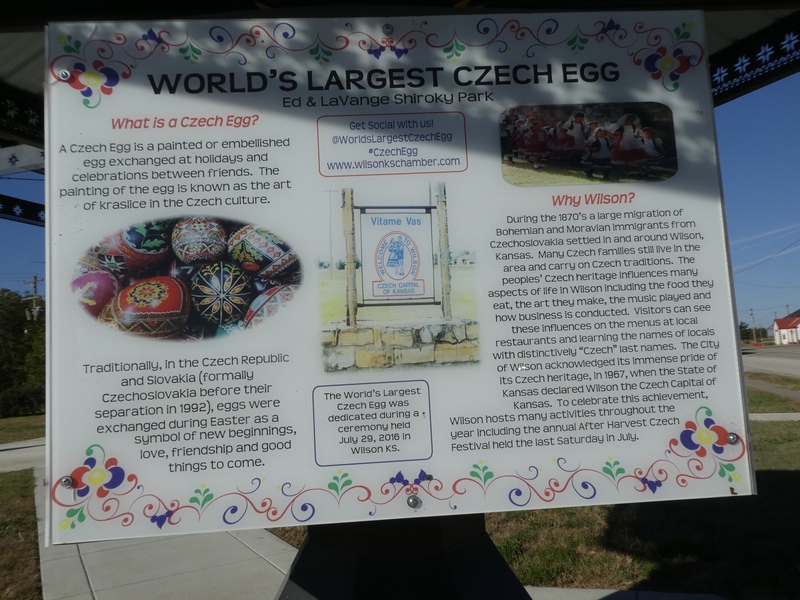 This is the largest painted Czech egg in the world. 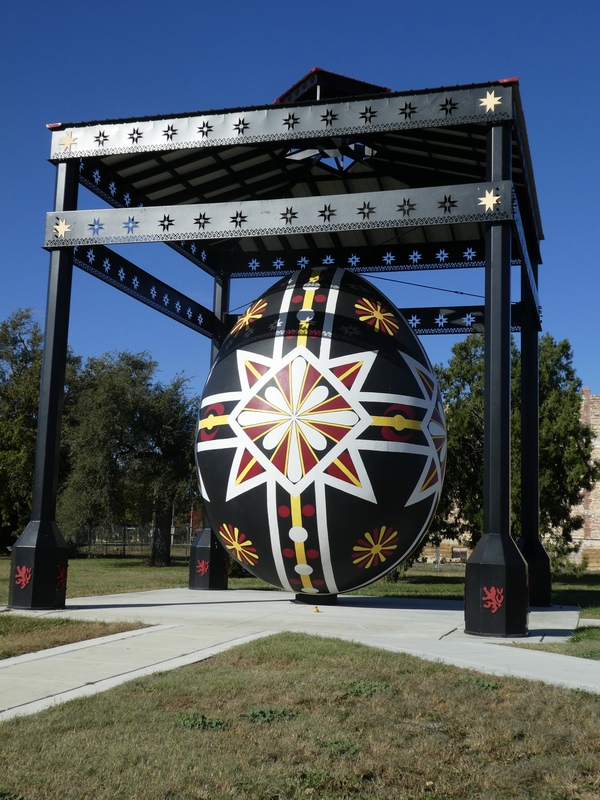 This egg, with a fiberglass shell weighing 8,000 pounds is 20 feet tall. It is also 15 feet wide and painted with traditional Czech patterns. This is some information about Czech painted eggs. I did not know that egg were exchanged during Easter in the Czech Republic. This is a nice tradition. Our next stop was the Wilson Chamber of Commerce and Visitor’s Center. Isn’t that a cute building, built in a popular style and colors in the Czech Republic? Unfortunately it was not open when we were there. Wandering around town, we found the Midland Hotel. 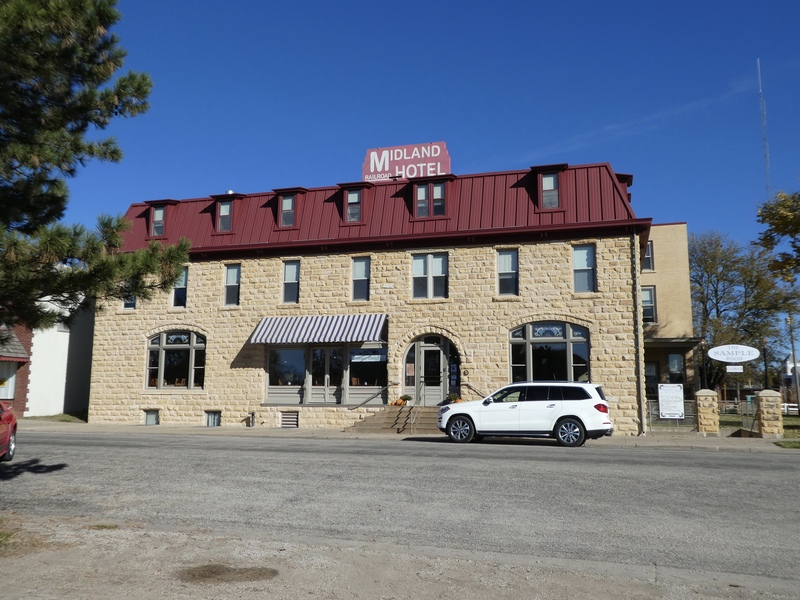 This 1899 three story limestone hotel still houses visitors in 28 restored period rooms. Online we found good reviews for The Sample Room, but it also was closed when we were there. Wilson is a rather small town. According to the 2010 census Wilson had a population of 781 residents. Near the Midland Hotel, in the park area between the hotel and egg, we saw this monument to honor Soldiers, Sailors and Marines. 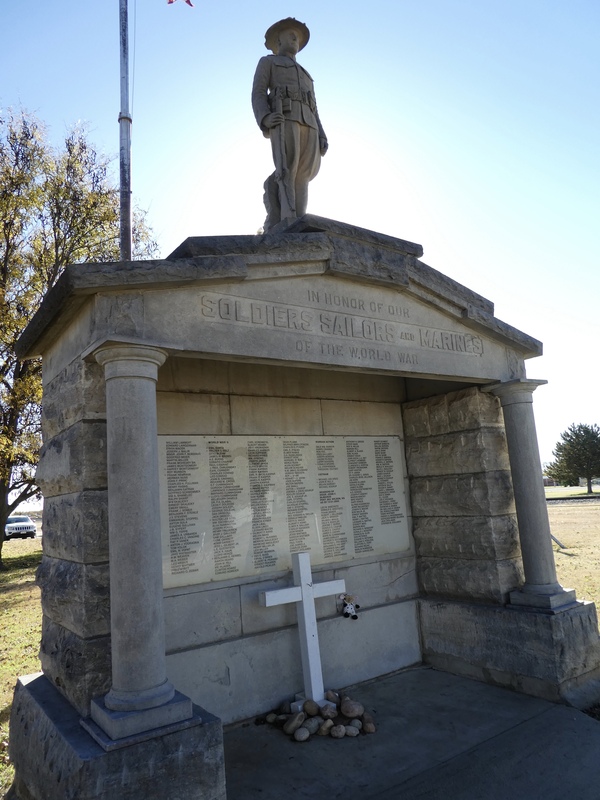 To honor Soldiers, Sailors and Marines. You will notice that I am not in this picture. Because we were traveling through America’s farmland, we added a new friend, this bear in a cow suit. We decided to have her pose for some photos while I rested. Being a model is hard work for a duck. 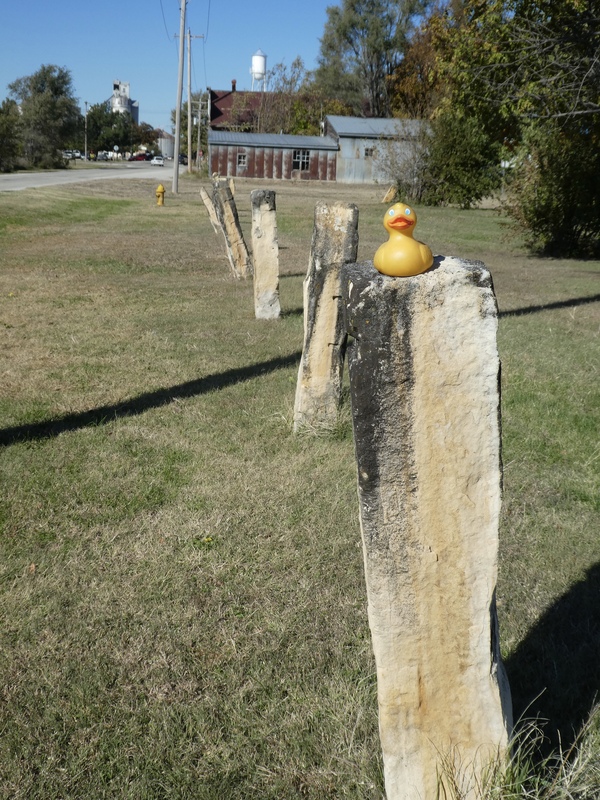 I, Zeb the Duck, noticed that these fence posts were unusual. They are made of limestone. This part of Kansas has a lot of limestone. Remember the hotel is made from limestone also. Leaving Wilson we drove a few miles north to Wilson Lake. See, we really are driving through America’s farmland. 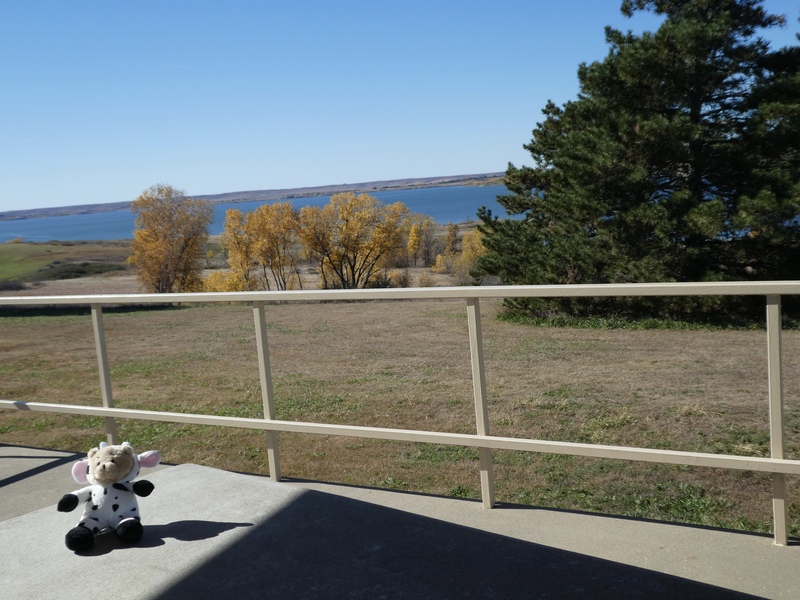 Wilson Lake is a large reservoir with parks and many recreation areas. 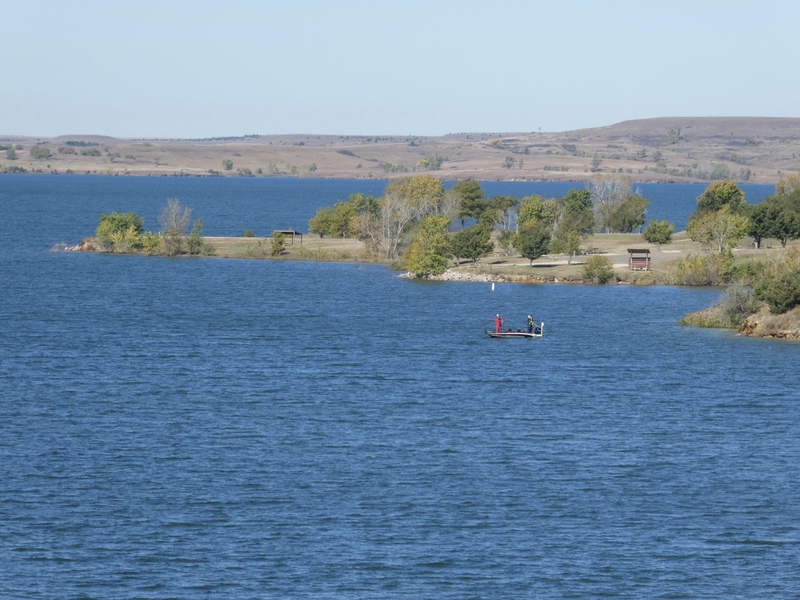 A couple humans are boating on Wilson Lake, trying to catch a few fish. There are nice picnic areas along the lake also. Our new friend likes picnics. 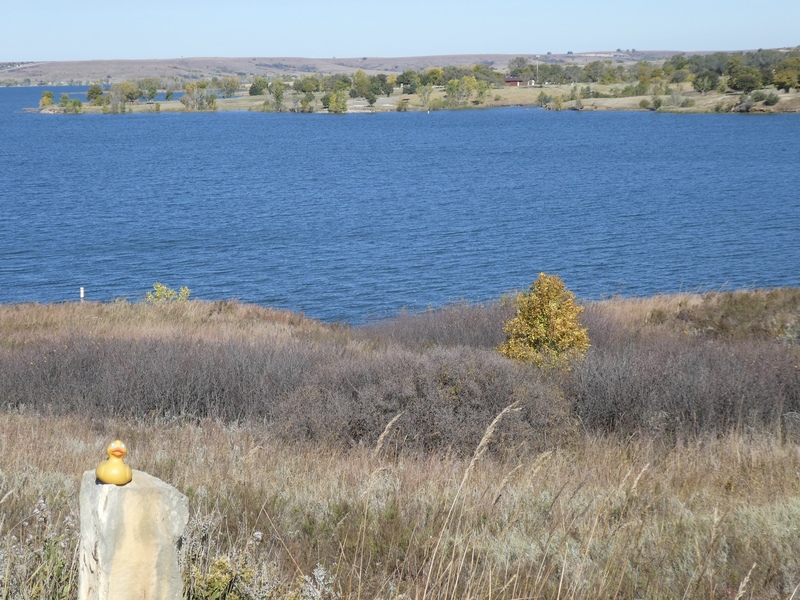 One last look at Wilson Lake and we continue on our journey. This is a great road trip. We are just driving for a few days with no plans and no time schedule. All we know is we want to be in Indianapolis, Indiana Monday. But more about that later. Time for more exploring now. 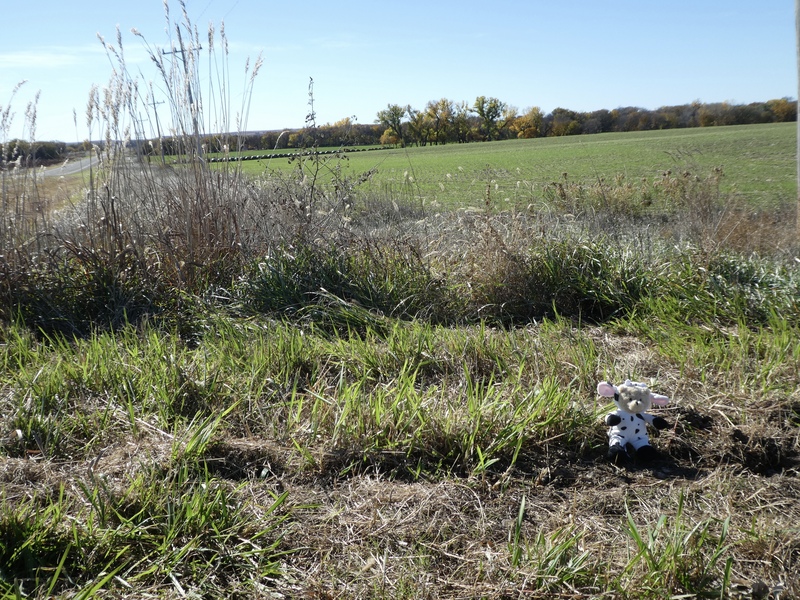 This entry was posted in Kansas, Uncategorized and tagged Colorado Traveling Ducks, Czech egg, fields, hay bales, Kansas, Midland Hoel, Wilson, Wilson Lake. Bookmark the permalink. Oh nice, a road trip with no need to rush. You’ll be stopping at all sorts of interesting places. That is one gigantic egg! We loved the egg. We enjoyed leisurely driving towards Indianapolis. Had a great time. Thanks for reading and commenting. This Czech egg was one of our favorites also.